The Euro extended higher and broke above pivotal barriers at 1.1574/78 (daily cloud top / Fibo 38.2% of 1.1815/1.1432 descend) as dollar was hit by US CPI miss. US inflation rose less than expected in September and fell below expectations (Sep CPI m/m 0.1% vs 0.2% f/c / y/y 2.3% vs 2.4% f/v and core m/m 0.1% vs 0.2 / core y/y 2.2% vs 2.3% f/c). Despite weaker than expected results, consumer prices remain steady and signal increase in inflation pressure, keeping the Fed on track for gradual rate hikes. Dollar's immediate reaction on weaker than expected data was negative, but markets need to digest results to have clearer picture. 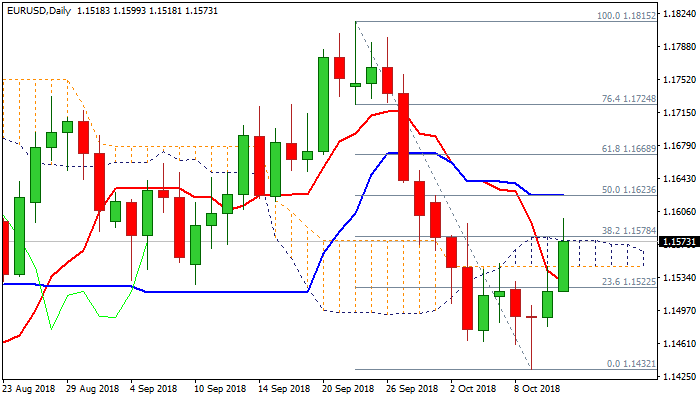 Initial positive post-data sentiment exists, however, close above key 1.1574/78 barrier is needed to sustain break above cloud and generate bullish signal for further recovery of 1.1815/1.1432 descend. A cluster of daily MA's (converged 30/20/100SMA's at 1.1616/28 zone), also 50% retracement of 1.1815/1.1432, marks next significant barrier, break of which would confirm reversal. Conversely, failure to sustain break above daily cloud would weaken near-term bulls and keep the downside vulnerable.